Breastfeeding twins can seem like a daunting task. Yet armed with tools like this My Brest Friend Twins Plus feeding pillow, you will soon find yourself feeding two babies simultaneously like a pro. My Brest Friend is the #1 Choice of Lactation Consultants and just like the Original My Brest Friend pillows, their twins plus nursing pillow features a wrap around design that secures to the body helping you and your twins maintain positioning and latch-on. 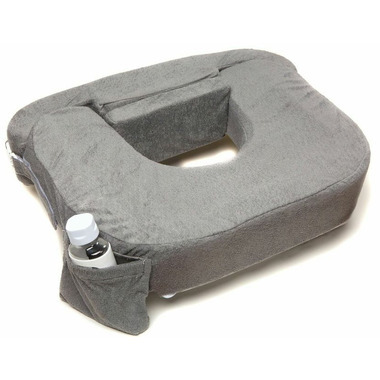 It has a back rest to help maintain good posture during feeding and the firm, flat cushion in the front keeps babies from rolling. Plus there is a convenient pocket holds water bottles, burp cloths, phone, and other items.